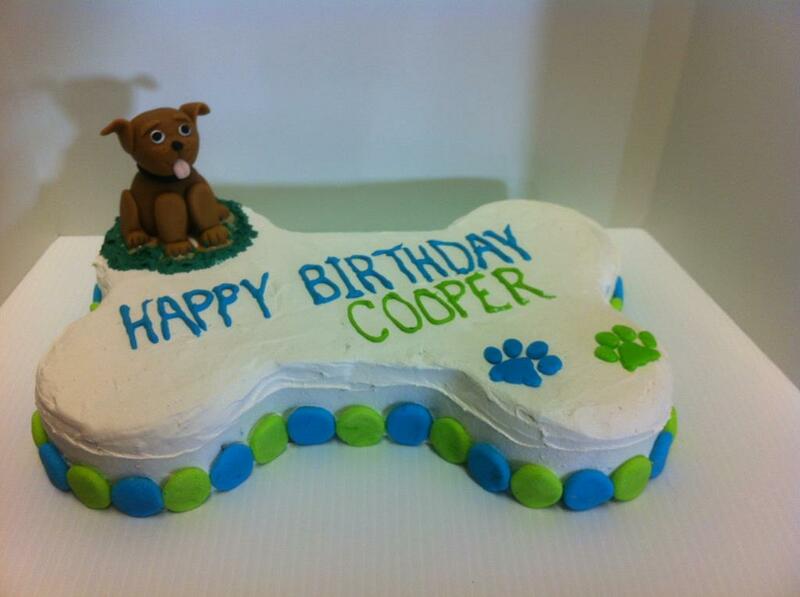 Easy dog cake decorating ideas that do not require special talent or skills! I have a dog treat business called 12 Paws Barkery. I have cake orders all the time. 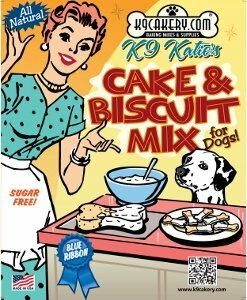 Thanks to K9Cakery for making such a great product!!! I couldn't do it without you. 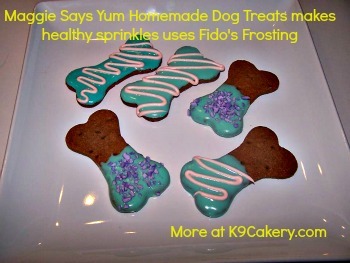 Just like you would decorate a human cookie, homemade dog treats can be decorated much the same. The traditional stand-by's are jimmies and sprinkles. These little delights come in many shapes and colors. 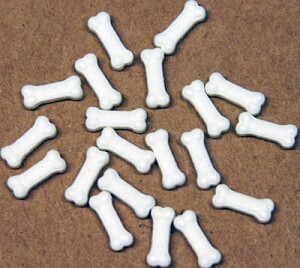 Use these specially made dog bone shaped sprinkles and listen to your human customers marvel at how cute they are! There are special colors and shapes for every holiday or occasion. Use them sparingly because they are made from sugar. 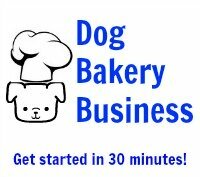 After icing your treats or frosting a dog cake, let a small bit of the dog treat frosting harden and then cut it up into very small pieces. 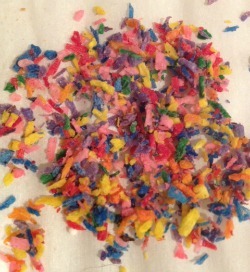 Sprinkle liberally on a dog cake or a dog treat! To make colored sesame seeds, purchase natural toasted sesame seeds and food coloring. You will get a much better result if you use professional food coloring. The little red, green, blue, and yellow bottles you can buy in the grocery store are very weak and usually do not yield a good result. Soak the sesame seeds in water plus food coloring for at least 24 hours. Sesame seeds are particular and will reject some food colorings. This is a trial and error process. Once they are colored, they must be dried. You cannot air dry sesame seeds. They will stay moist and sprout! It is not easy to dry sesame seeds without professional equipment. The best option at home is to spread them thin in an oven safe dish or on a sheet pan and put them in the oven at 300 degrees. But be sure to watch them closely, stirring them around often or they will burn. 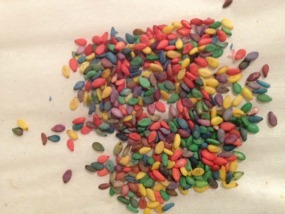 Luckily, colored sesame seeds can be purchased retail all packaged and ready to go. The manufacturers have the proper equipment and their product will thus be more colorful and uniform than what you can do at home. Like sesame seeds, colored coconut is another great topping for dog treat icing. Coconut takes color well and gives a vibrant look to any homemade dog treat. Like sesame seeds, the coloring process is much the same. While coconut seems to take color better than sesame seeds, it is harder to dry as it burns easily. And the coconut flakes that you buy in the grocery store are usually sweetened with sugar, thus defeating the reason you may have opted for them in the first place. But not to worry, the marketplace has a solution for that as well. You can purchase colored organic coconut that contains no sugar. 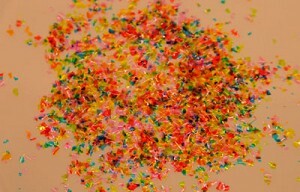 It sprinkles just like sugary sprinkles but, like sesame seeds, it is healthy. Topping off your dog treat icing with edible glitter gives a dramatic effect. But, like we have said in other parts of this site, read the ingredients. Many edible glitters are made from 100% sugar. Again, that is fine if you are okay with it but there are better options. There is an edible glitter that glimmers in the light and comes in many colors, but is 100% sugar free. It is made from gum arabic, a common, safe, natural cooking ingredient. 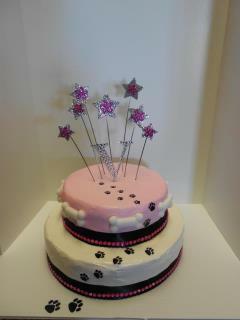 The perfect tool to use when writing words for dog cake decorating ideas or accenting treats or cakes with fine lines. You get a 3-D puffy result. Colored writer are perfect to use when outlining areas to fill with Magifrost dog treat icing. When you want to write a 3-D message on a homemade dog treat or include a fancy fine decoration, this is the tool for you. This is not the writing gel for cakes that you find in the supermarket. Those gels are designed to stay wet while the colored writer is designed to dry hard. This facilitates shipping your treats to friends and neighbors while keeping your message intact. 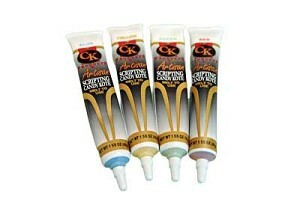 To use the colored writer, you have to first place it in a cup of hot water to melt it right in the tube. Once used, they dry hard in a short period of time.